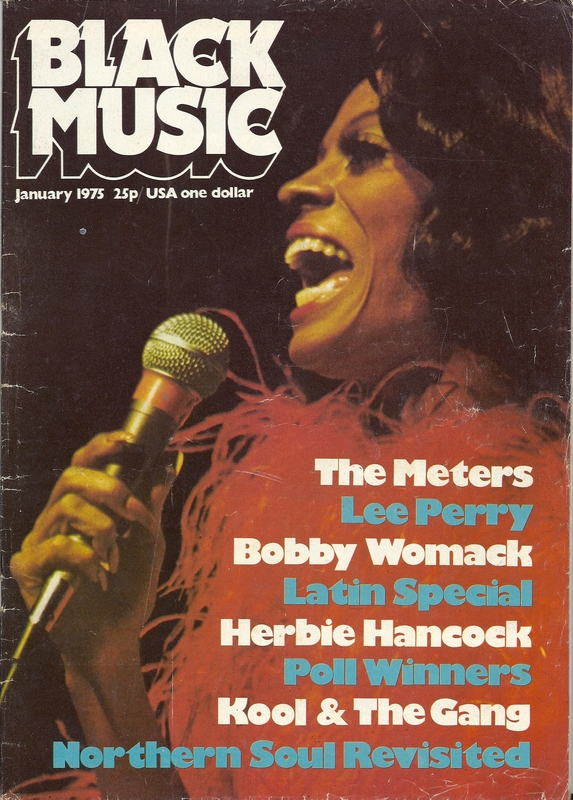 Black Music Jan 1975 featuring Bobby Womack. Kool and The Gang. Latin Special. The Dave Godin Special plus Northern Soul Revisited by Tony Cummings. 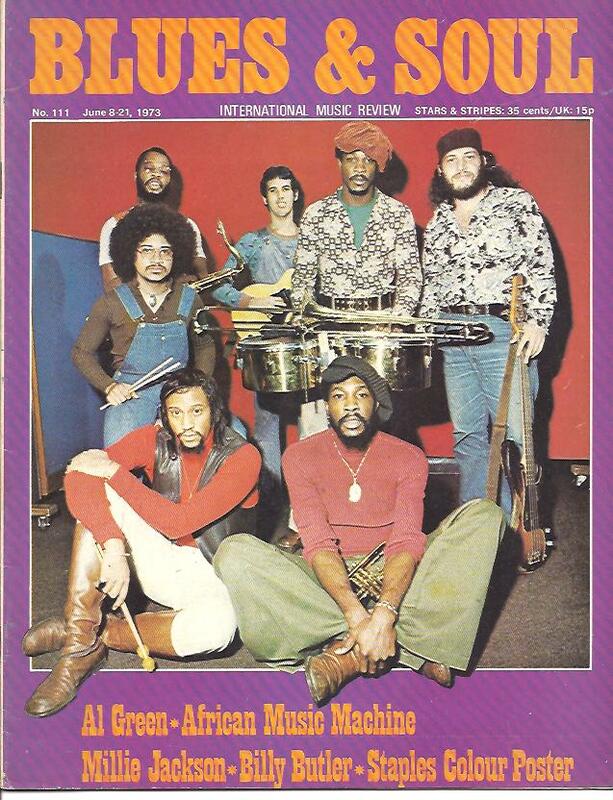 Black Music Sep 1974: The Main Ingredient Story. Rare Soul Ian Levine. Impressions - Keep On Pushing. The Crusaders. Dave Godin on the club scene. Ads: Inter City Soul Club. 3 pages of record specialists. Whats Going On. North Wales Soul Club. Sale Mecca. Carlton Club Warrington. 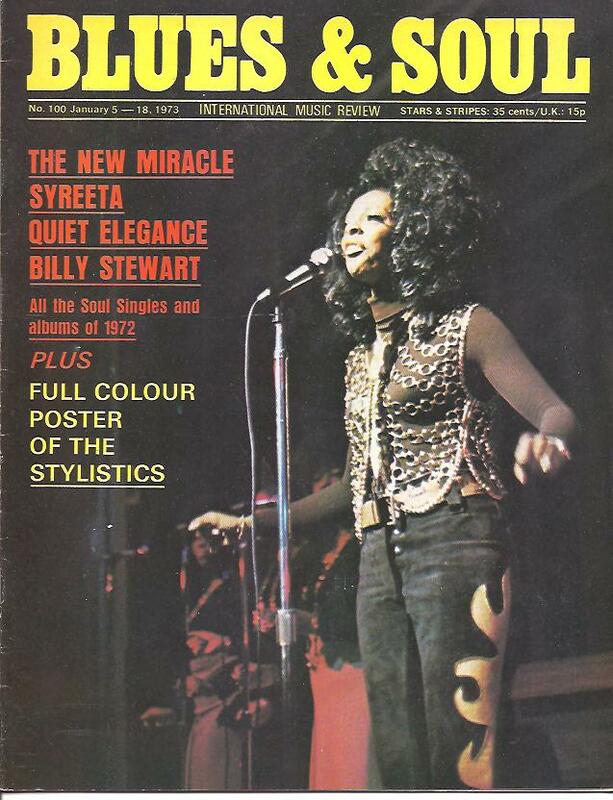 Blues And Soul Issue 5-18 Jan 1973 Inc: Syretta - Lady Wonder. A New Miracle - Miracles. Two Glories plus One Vandella equals Quiet Elegance. Billy Stewart. Full Colour Poster of The Stylistics - Hall Of Fame. All The Soul Singles And Albums Of 1972. UK and US 45s and LP's reviewed and charts. Ads: Torch Tunstall All Nighter. 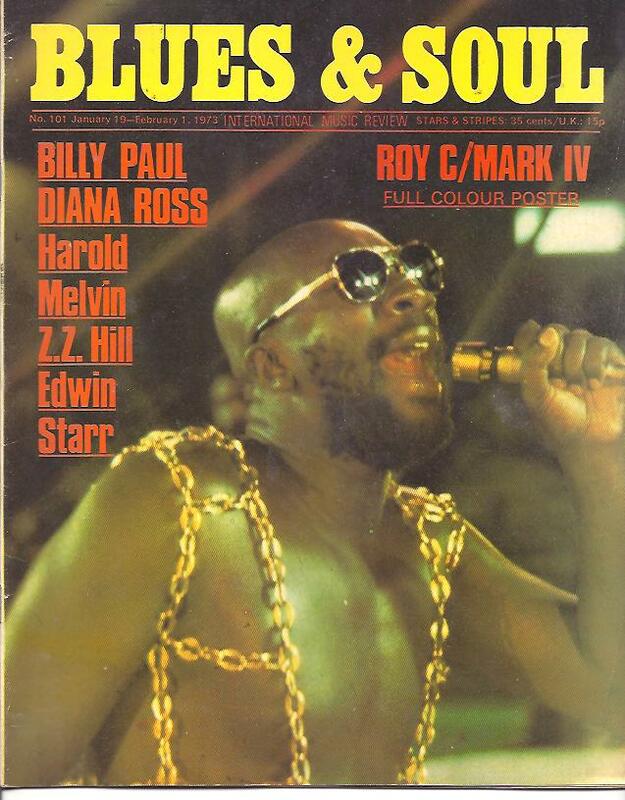 Blues And Soul Issue 101 19 Jan - 1 Feb 1973 Inc: Billy Paul. Diana Ross - Film review of Billie Holiday. Harold Melvin. ZZ Hill. Edwin Starr. Luther Ingram. Roy C plus The Mark IV Double Page Poster. 1 Page featuring Major Lance (Live At The Torch) - The Right Track. UK and US 45s and LPs reviewed and charts. Ads: Museum Hall Of Soul Selby. Beefeater nr Whitchurch. Torch Tunstall Stoke All Nighter. 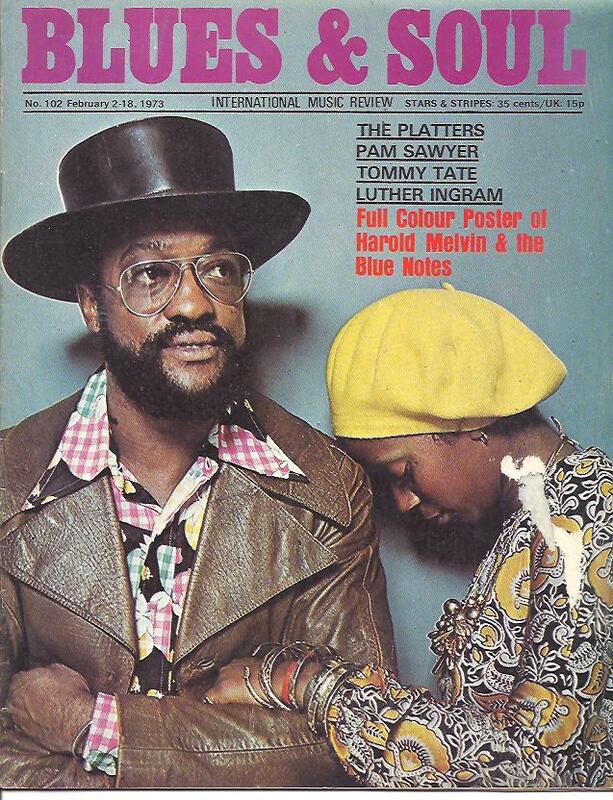 Blues and Soul Issue 102 2-18 Feb 1973: The Platters. Pam Sawyer. Tommy Tate _ A Modern Day Bluesman. Luther Ingram. Full Colour Poster of Harold Melvin and The Blue Notes. In pen and paper John Fisher writes "The Sad Late Blackpool Mecca" UK and US 45s and albums reviews and charts. Ads: Top Rank Hanley S-O-T. Check Out The North by Frank Elson - The first regular Northern soul report. 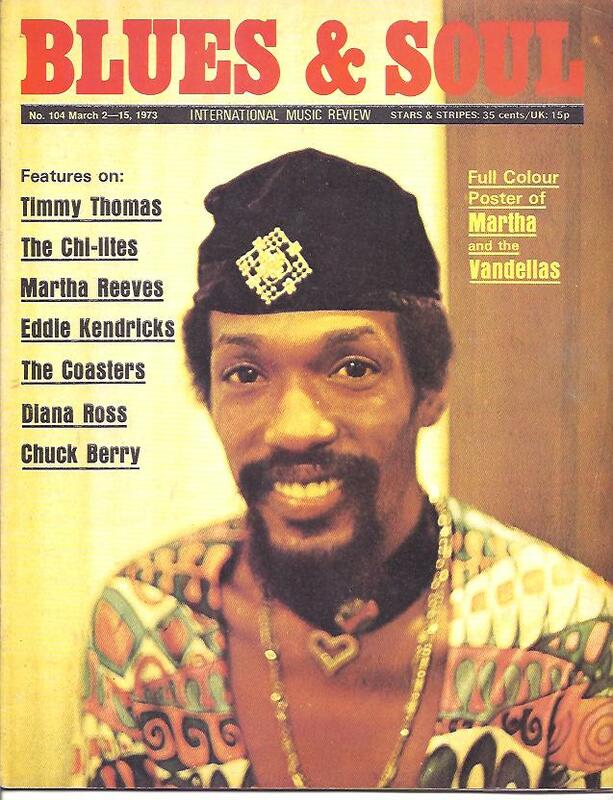 Blues And Soul Issue 103 16 Feb - 1 Mar 1973 Inc: Wattstax Movie. Mona Richarsson. Ritchie Pitts. 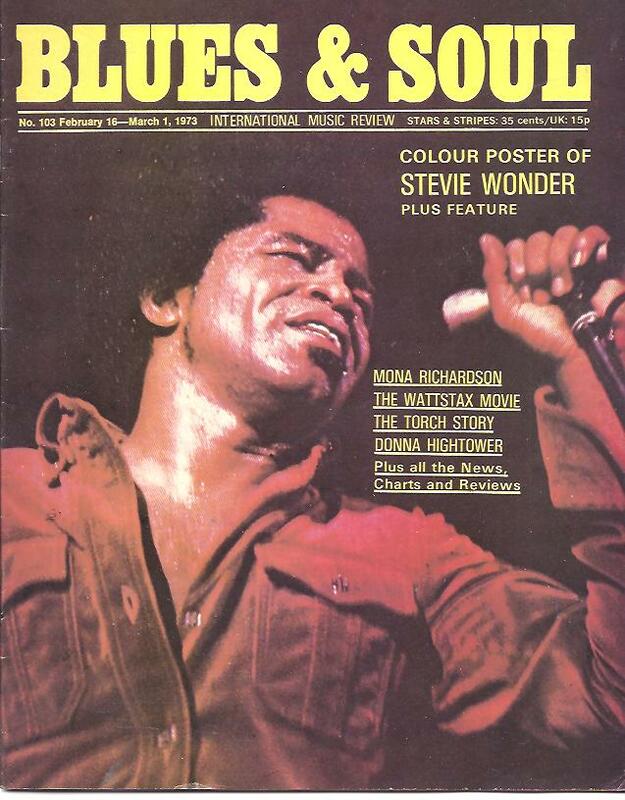 Donna Hightower - Spain's First Lady Of Soul. . Centre pages Colour Poster Of Stevie Wonder - Man Of Tomorrow. The Torch Story (2 Pages - Northern Soul History) Ads: Catacombs Club Wolverhampton. 76 Club Burton-On-Trent. Birds Nest. Beefeater nr Whitchurch. Frasers Guildford. Wigan Rugby Club. 1 Page Ad International Soul Club featuring The Totch Tunstall, Top Rank Hanley and Top Rank Watford. UK and US 45s and albums reviews and charts. 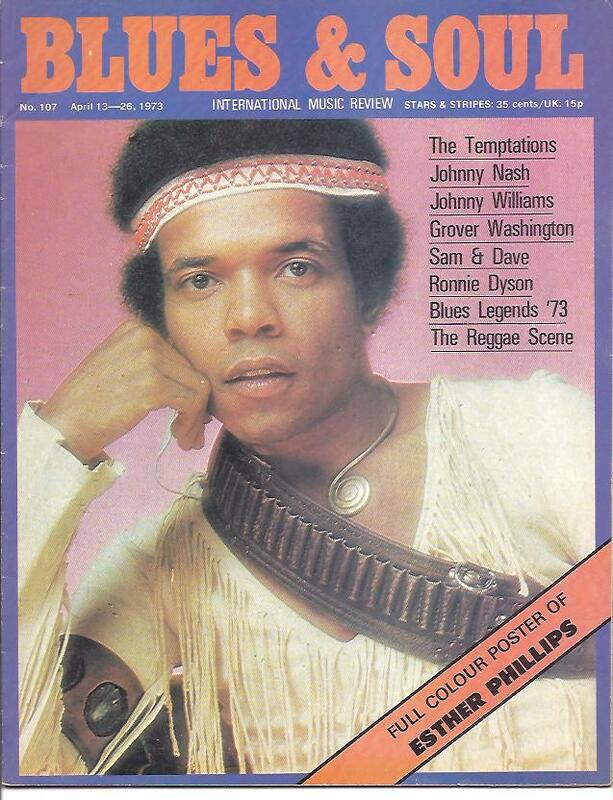 Blues And Soul Issue 104 2-15 Mar 1973 Inc: Timmy Thomas - The One Man Band. The Chi-Lites. Martha Reeves - A Lady With A Big Future. Eddie Kendricks - Holding On. Coasters - Coastin Along. Diana Ross. 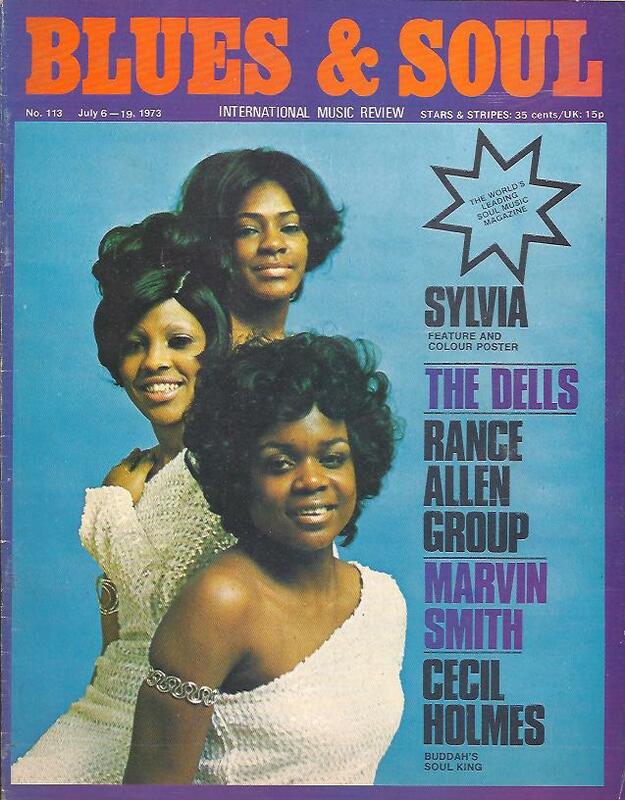 Full Colour Poster Of Martha and The Vandellas. Check Out The North by Frank Elson 2 pages. Ads 1 Page International Soul Club. Hypnotique Nantwich Cricket Club. Club York. Warrington Co-Op. Pendle Hotel Chatburn. Trogs Farnworth. Whitchurch Civic. Beefeater Whitchurch. Shades Northampton. Catacombs Wolverhampton. Frasers Guildford. UK and US 45s and albums reviews and charts. 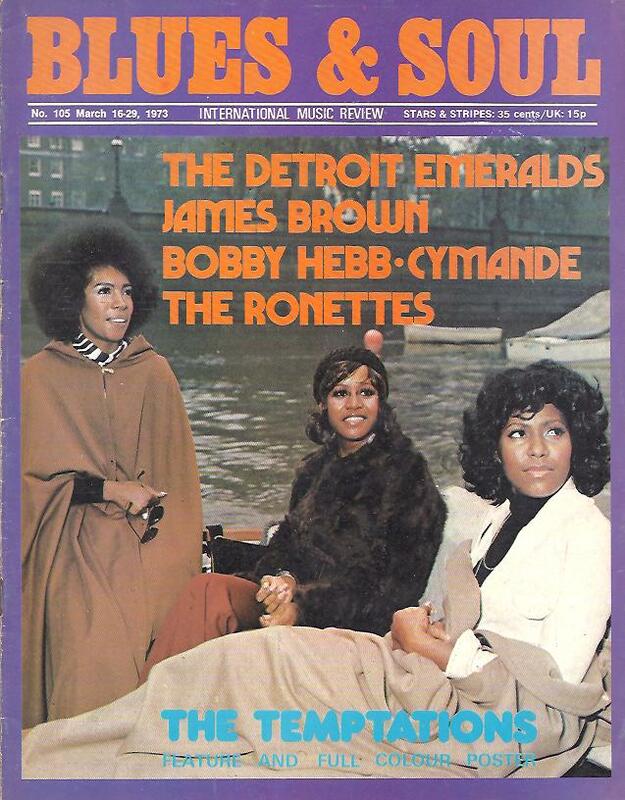 Blues And Soul Issue 105 16-29 Mar 1973 Inc: Detroit Emeralds. James Brown - Brilliant or Boring. Bobby Hebb - Six Years On From Sunny. Ronetes. Full 2 page centre fold Colour Poster Temptations. 45s and Lps charts and reviews. Ads Catacombs Wolverhampton. Frasers Guildford. Top Rank Hanley. Co-Op Hall Warrington. Trogs Farnworth. Beefeater Whitchurch. International Soul Club. Frank Elson's Check Out The North, a review on the 76 Club Burton On Trent and profile on DJ Martyn Ellis and Alan Day. Blues And Soul Issue 106. Mar 30 - 12 Apr 1973. Al Green and Gladys Knight Pol 72's Top Male and Lady Vocalist. Temptations, Supremes and Junior Walker LIVE. Clydie King. 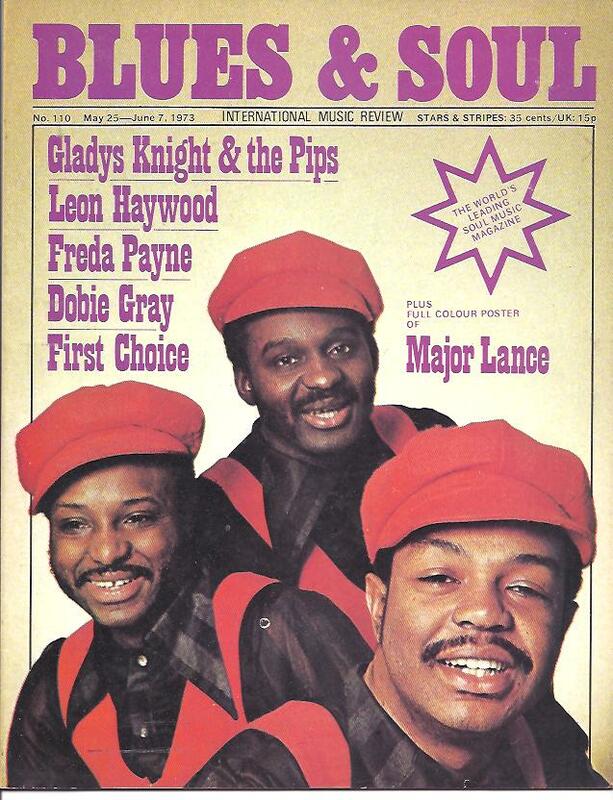 Two Page centre Colour Poster - Gladys Knight and The Pips. Ads: Tony Bank's Leeds Central. Catacomb's Pendulum Manchester. The Raven Whitchurch. Wigan Rugby Club. Whitchurch Civic Soul Festival Easter Monday All Dayer. Frasers Guildford. Trogs Farnworth Bolton. 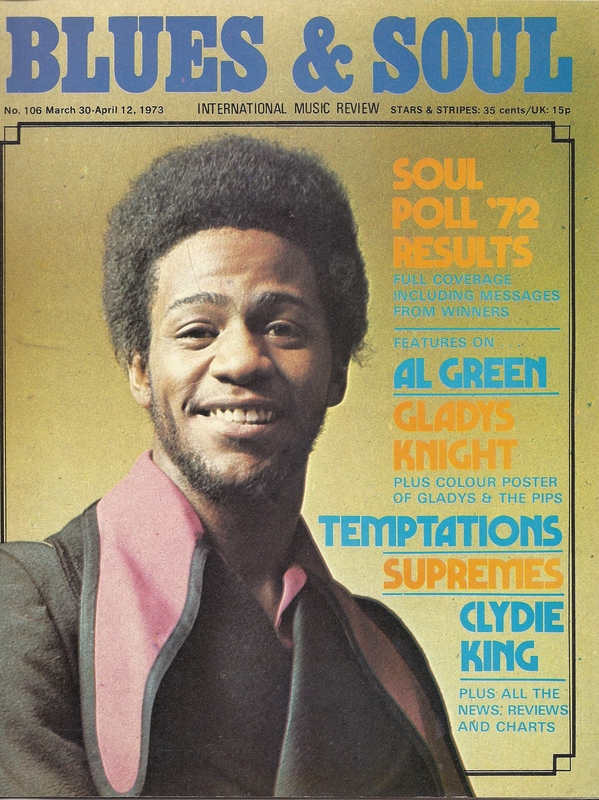 Blues And Soul Issue 107 13-26 Apr 1973 Inc: Temptations - Present A Masterpiece. Johnny Nash. Johnny Williams - Slow Motion To The Top. . Sam and Dave Live. Ronnie Dyson. The Reggae Scene. Colour Poster Of Esther Phillips. Check Out The North - Frank Elson. The Reggae Scene. Ads: Catacombs Wolverhampton. Mexborough - An Evening Of Soul -27 Apr 1973. Civic Hall. International Soul Club. Frasers Guildford. The Wheatsheaf Fulham. 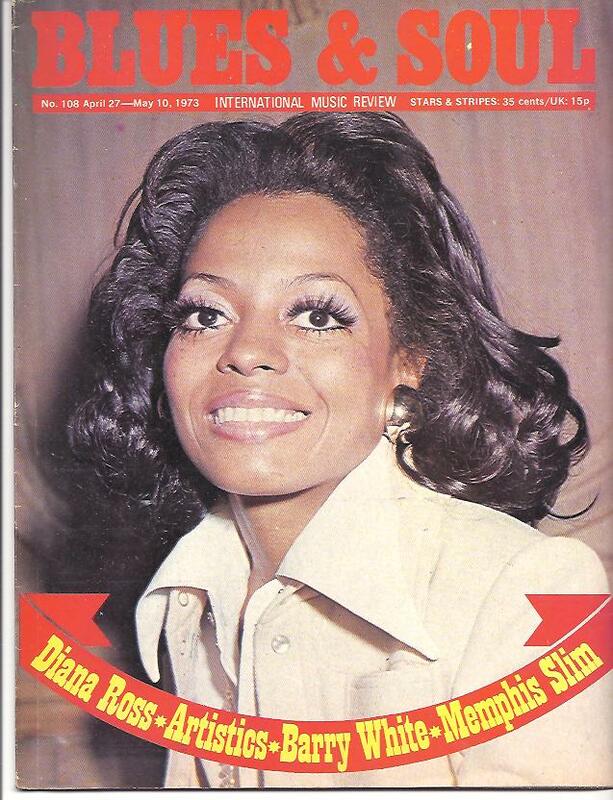 Blues And Soul Issue 108 27 Apr - 10 May 1973 Inc: Diana Ross - The Lady Is A Winner. The Artistics. Barry White - A Potential Superstar. Memphis Sim. Double Page Colour Poster Millie Jackson. Ads: Catacombs Club Wolverhampton. Trogs Boton. Northern Soul Club. Central Soul Club Leeds. Russ Everysound Disco. Blackpool Highlands Room. Manchester Pendulum plus Frank Elson's Check Out The North. 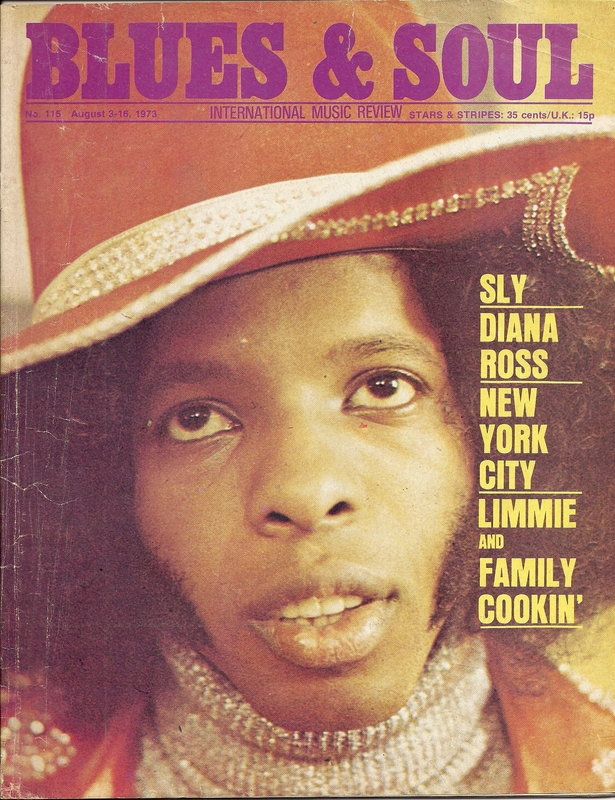 Blues And Soul Issue 109 11-24 May 1973 Inc: The Stylistics. Billy Paul - The Age Old Problem Of The Follow-Up?. Bunny Sigler -On A Winning Streak. The Lost Generation. Al Green Double Page Full Colour Poster. Ads: Catacombs Wolverhampton. Shades Of Green Camberley. Blackpool Mecca. Tiffany's Newcastle Staffs. Frasers Guildford. Frank Elson's Check out The North! 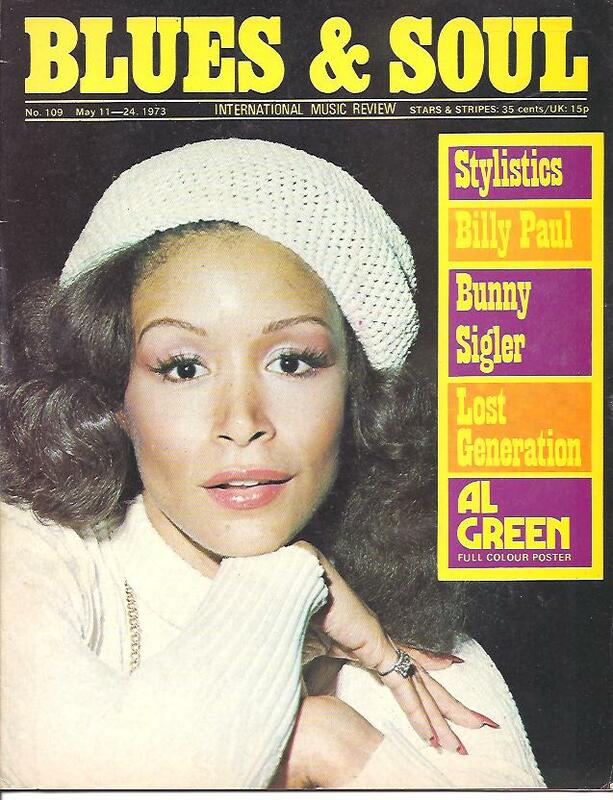 Blues And Soul Issue 111 8-21 Jun 1973 Inc: Al Green Is A Killer. Esther Philips Live. Millie Jackson. Billy Butler. The Staples Singers 2 Page Full Colour Poster. Record company new release adverts. US RnB Top 50 45's. Soul City Top 30 45's Ads: 1 Page Va-Va's Bolton. Major Lance at The Speakeasy Crewe. Top Rank Hanley. Shades Of Green. Pendulum Manchester. Catacombs Wolverhampton. Blackpool Mecca. Northern Soul Club: The Royal Hotel Crewe. The Carltob Club Warrington. The Raven Nr Whitchurch. 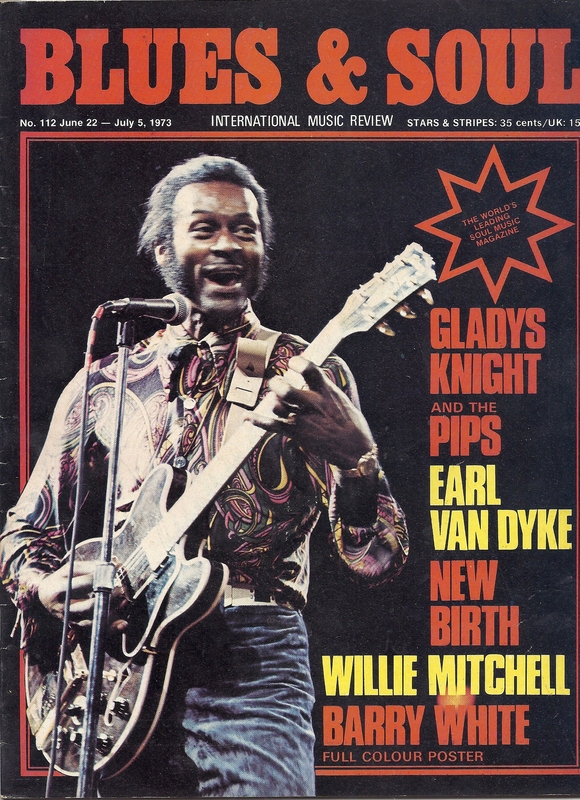 Blues and Soul Issue 112 22 Jun - 5 July 1973: Gladys Knight - A Standing Ovation. An Interview with Earl Van Dyke. New Birth. Willie Mitchell. Barry White 2 page full colour poster. Ads: In-To-Soul At The Intercom Hull. Market Drayton BBQ Jun 30. Samanthas Sheffield. Check Out The North By Frank Elson. Everysound Disco Wigan. International Soul Club. Pendulum Manchester. Frasers Guildford. Top Rank Suite Hanley Stoke On Trent. Harry's Stoke On Trent. The Northern Soul Club prsents The Royal Hotel Crewe. The Carlton Club Warrington. The Raven Whitchurch. 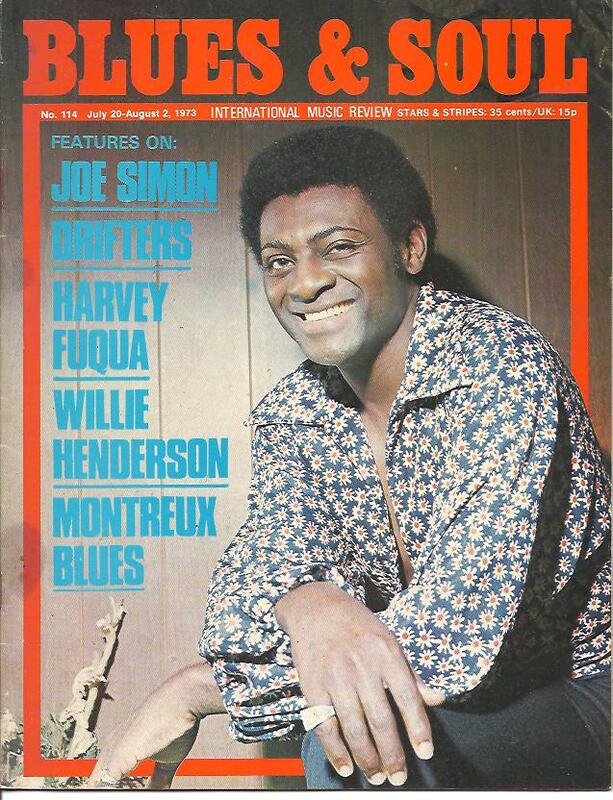 Blues And Soul Issue 115 3-16 Aug 1973. Sly. Diana Ross. It's The Real Thing. Behind The Scenes With Carl Davis. New York City - Doing Fine Now. Limmie and Family Cookin - Finally Cookin'. Full 2 Page Colour Poster The Independents. UK and US 45s and Lps charts. Ads: One Page Bolton Va-Va's All-Nighter. Wigan Rugby Club. Sheffield's Samantha's. Samantha's Sheffield. Keighley Soul Club. Birds Nest. Coventry's Mr George. Sounds Of Soul Doncaster DJ Snowy. Manchester's Pendulum. Check Out The North with Frank Elson featuring Wolverhampton's Catacombs. 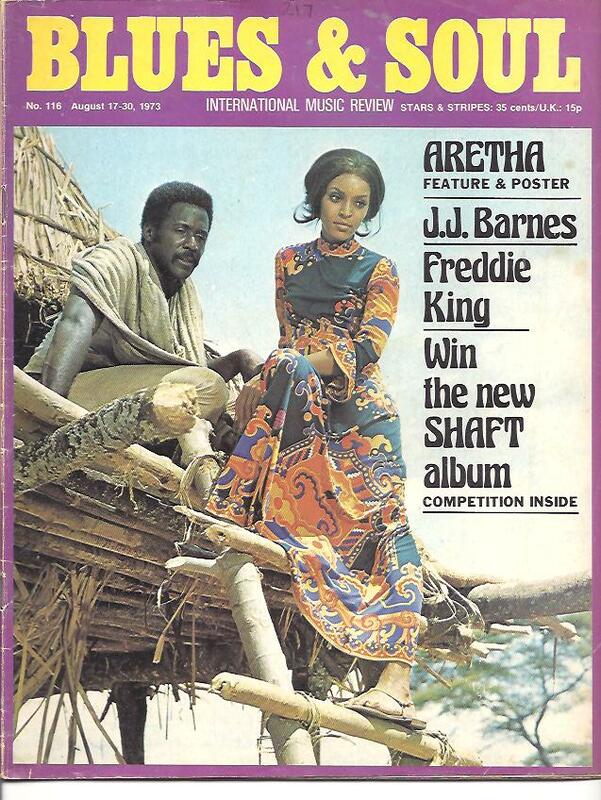 Blues And Soul Issue 116 17-30 Aug 1973 Inc: JJ Barnes - Good Men Don't Grow On Trees.. Shaft In Africa. Freddie King. The Reggae Scene. Aretha Franklin 2 Page Double Feature and Poster. UK and US 45's and LP's charts. Ads: Catacombs Club Wolverhampton. Mr Georges Club Coventry. Nautical William Kidderminster. Russ Everysound Disco Wigan. Pendulum Manchester. Greyhound Dunstable. Guildhall Gloucester 7 Sep featuring Major Lance. Whitchurch All Dayer. Blackpool Mecca. Check Out The North with Frank Elson! Aug 31 - 13 Sep 1973. 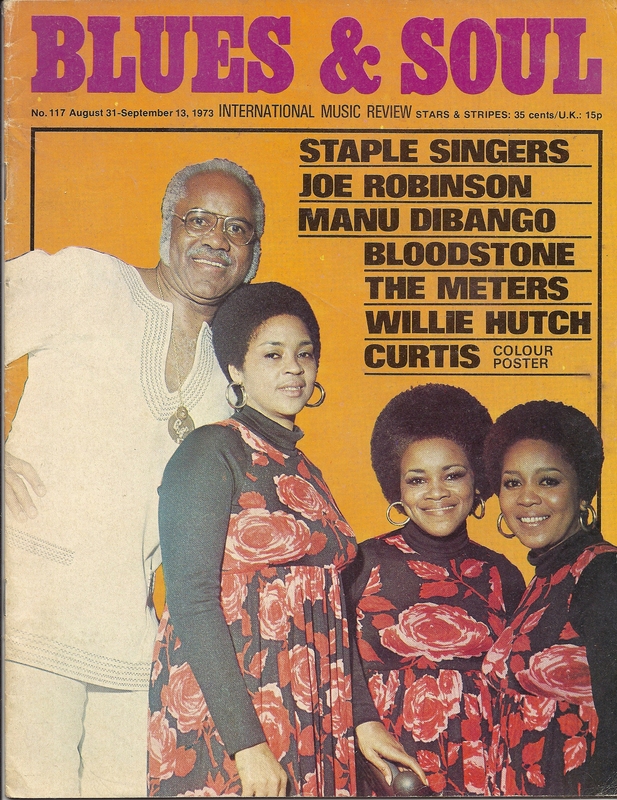 Blues And Soul Issue 117 The Staple Singers. Joe Robinson. Bloodstone. Willie Hutch - This Brother Worked It Out. 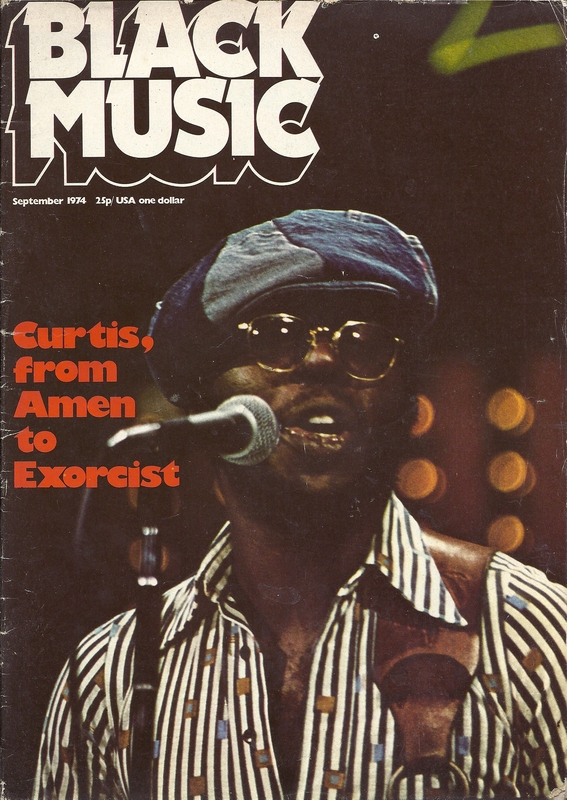 2 Page Full Colour - Curtis Mayfield. UK and US 45's and LP's charts. The Reggae Scene. Check Out The North with Frank Elson. Ads. 1 Page Va-Va's Bolton All Nighter. Okeh Club. Sheffield Samantha's. Peacock Room Blackpool. The Greyhound Dunstable. Club Lafayette Wolverhampton. River Boat Room Rhos On Sea. Coventry Mecca. Pendulum Manchester. Marchan Hall March.